Used to show all of the published Newsfeeds in a given Category. Note that Newsfeed Categories are separate from Article Categories. Newsfeed Categories are entered by selecting Components/Newsfeeds. See Newsfeed Category Manager and Feeds Manager for more information. 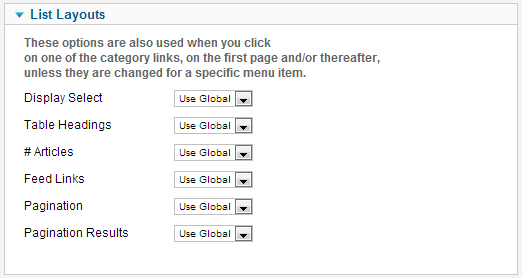 Click the Menu Item Type Select button and then click the List News Feeds in a category link under Newsfeeds. To edit an existing Newsfeed Category Menu Item, click its Title in Menu Manager: Menu Items. Used to show newsfeeds belonging to a specific Category in a list layout. The Category layout is a convenient way to list a compact directory of newsfeeds in a category that can include filtering and searching. 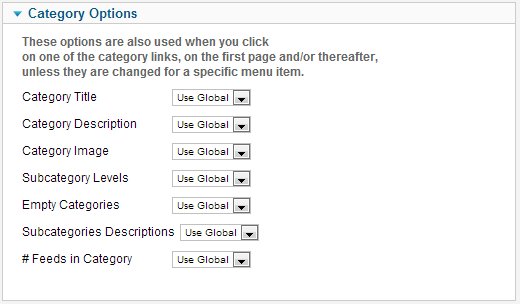 To create a new Category see Newsfeed Categories Manager: Add or Edit. This page was last modified on 21 March 2013, at 14:07.